The Big Brother Naija 2018 housemates had their very first Diary Session since the game reset. The last 24 hours in the House have been a wild ride and many of the Housemates obviously had a lot pent up inside, that is probably why last night's Diary Sessions were so loaded. It is now becoming a tradition that at least one Housemate has a meltdown during Diary Sessions and last night it was Bambam. 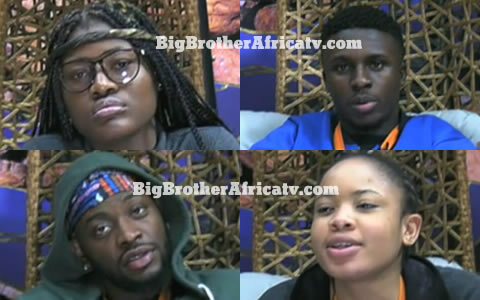 Bambam said it was due to the fact that she was sick of the other Housemates and how they were trying to make her seem fake when they don’t even know her but it was probably because she was put up for Eviction along with Teddy A, Nina and Cee-C. She expressed her deep love for the Big Brother brand and how much she has enjoyed the game but that she was just so tired of the Housemates. All but Teddy A of course. Alex always lets it ALL out during her Diary Sessions and last night was no different, she was utterly infuriated at the fact that Khloe was back in the House and particularly perturbed that Khloe told her "I gave you my man". Alex also went on and on about Leo, stating that no one understands her like him and that he is the only person that could calm her down in the House. While there may be a lot of oestrogen in the House at the moment, last night the guys kept it very cool in the Diary Room. Teddy A, who is up for Eviction was as cool as ever, but he did state that he is sick of all the pettiness in the House and uses smoking as an escape. Tobi was elated as he had just won HoH and gotten his strike removed due to the game reset, Miracle was chattier than usual but still chilled and quite positive. Lolu's Session was another interesting one as Biggie put him on the spot about his current situation with Anto. He looked sheepish and acted as though he did not know why Anto was feeling different towards him. He did say that he would make a point out of having a conversation with her soon to figure out the exact source of her anger towards him. Cee-C appears to be taking the Game Reset seriously and is doing her best to turn over a new leaf, it could that she is fearful of Khloe or just plain disappointed in her past behaviour but yesterday she hashed out her issues with Nina and last night, after the Diary Sessions she chatted calmly to Khloe. She told her about her issues with Tobi and treaded lightly, something we have not seen from Cee-C in a while.